UNCASVILLE, Conn. — The official weight-in was held today for tomorrow night’s ESPN Friday Night Fights Triple-Header, presented by DiBella Entertainment, in Mohegan Sun Arena. Live coverage of tomorrow’s ESPN Friday Night Fights tripleheader from Mohegan Sun Arena begins at 10 p.m. ET on ESPN2 and will also be available through WatchESPN on computers, smartphones, tablets, Amazon Fire TV and Fire TV Stick, Apple TV, Chromecast, Roku, Xbox 360 and Xbox One via an affiliated video provider. ESPN Deportes’ Noche de Combates will also carry the three fights live on broadband Spanish-language ESPN Deportes+. The telecast opens with Teven “American Idol” Farmer taking on Angel “El Gato” Luna in a scheduled 8-round contest in the junior lightweight division. Farmer vs. Luna will be followed by an 8-round featherweight showdown matching undefeated Ryan “The Polish Prince” Kielczweski against Danny Aquino. The main event pits undefeated junior middleweight prospect Tony Harrison against Pablo “Supurlturero” Munguia in a 10-round title bout. Below find fighter weights and pictures by Ed Diller / DiBella Entertainment. TONY HARRISON (20-0, 17 KOs), Detroit, MI 154 ½ LBS. PABLO “Supurlturero” MUNGUIA (20-6, 11 KOs), Distrito Federal, Mexico 153 LBS. RYAN “The Polish Prince” KIELCZWESKI (22-0, 6 KOs), Quincy, MA 123 ½ LBS. DANNY AQUINO (16-2, 10 KOs), Meriden, CT 123 ½ LBS. TEVIN “American Idol” FARMER (18-4-1, 4 KOs), Philadelphia, PA 130 LBS. ANGEL “El Gato” LUNA (10-0-1, 6 KOs), Brooklyn, NY 128 ¼ LBS. LENNOX “2 Sharpe” ALLEN (18-0-1, 11 KOs), New York, NY 169 LBS. PAUL GONSALVES (7-6-1, 3 KOs). Harwich, MA 170 LBS. 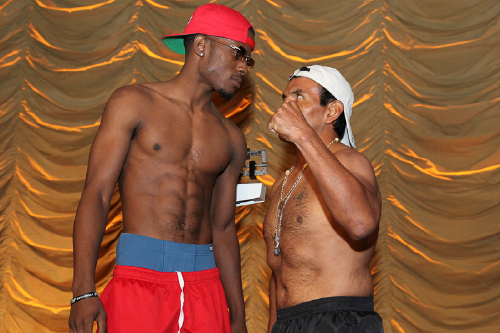 ALANTEZ “SlyAza” FOX (14-0-1, 4 KOs) Forestville, MD 158 ¼ LBS. FRANKLIN GONZALEZ (16-13, 10 KOs), Santo Domingo, Dominican Republic 161 ¼ LBS. REGIS PROGRAIS (13-0, 11 KOs), Houston, TX 143 ½ LBS. ABRAHAM “The Swift” ALVAREZ (19-7-1, 9 KOs), Rosario, Sinaloa, Mexico 142 LBS. AMOS “2 Smooth” COWART (10-0-1, 8 KOs), Groveland, FL 134 ½ LBS. ANTHONY BURGIN (8-1, 1 KO), Philadelphia, PA 134 LBS. CASSIUS CHANEY (pro debut), Philadelphia, PA 245 ¼ LBS.